THE SNOWS OF WINTER melt away into warmer but windier days and we find that spring is now upon us and plants are re-emerging from their winter dormancy. Trees burst into flower, scattering pollen like crazy in the strong April winds, and shrubs produce new leaves and blooms of their own. Manzanita is one of our earliest-blooming shrubs and have delicate bell-shaped, light-pink flowers that bloom in clusters. 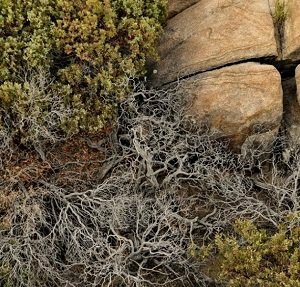 Manzanita grows in large interwoven communities in chaparral and also forms a significant part of the understory of woodlands and ponderosa pine forests. As such, they have many adaptations that allow them to survive in our region. Their leathery, oval-shaped leaves grow in such a way that they provide shade for the plant and help it to conserve water during scorching summer days. Manzanita will burn readily in a low wildfire, but will soon re-establish itself from seeds left behind in the soil. The manzanita is an important species of the Arizona Central Highlands. Its dense growth provides cover for small mammals and reptiles and its flowers provide nectar to resident Anna’s Hummingbirds (Calypte anna). 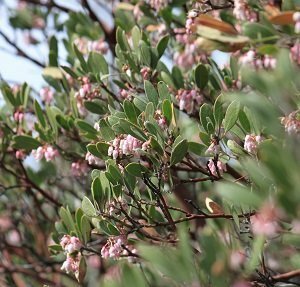 These manzanita blooms are also an important food source for many other migrating hummingbirds, who fly through in early April. 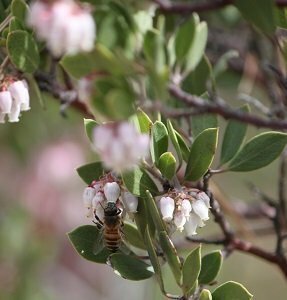 Several insects also use the manzanita as a source for nectar or a handy place to lay their eggs. Manzanita means ‘little apple’ which comes from the small edible fruit that grows from the clusters of flowers. Just like an apple, they are first green before turning red. They are eaten by birds, rodents, bears, and humans – both early Native Americans and non-Native early settlers, who made them into jams and jellies. Because so much precipitation has been received this year, all the flowers and flowering shrubs should be exceptionally bountiful. Butterflies, bees, flies and wasps should increase due to the increased amount of food sources. All will be hatching soon to emerge and continue their life cycles. One of the wonders of nature is that these organisms are all interdependent. So head out to the woods to observe their interactions!